Jordan traded the shoes for a pair of tickets after scoring 37 points against the Jazz en route to his third NBA title. (Courtesy of Alex Rodriguez) Former Utah Jazz ballboy Alex Rodriguez poses with NBA Hall-of-Famer Michael Jordan. Rodriguez is selling a pair of game-worn shoes Jordan gave him in 1993. Utah Jazz ball boy Alex Rodriguez wouldn’t take money from Michael Jordan, so MJ came up with another way to pay him for two tickets to a sold-out Jazz-Chicago Bulls game in 1993: his shoes. “You don’t have an idea of what they’d be worth, you just knew that they were the meccas of game-worn shoes,” Rodriguez said. 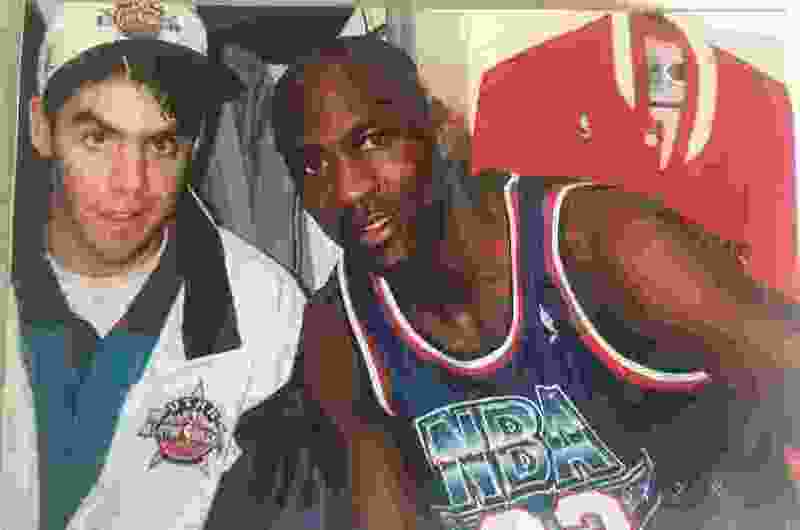 Hours before Jordan went off for 37 points that night, scoring 20 points in the fourth quarter to will the Bulls to a 96-92 win, Rodriguez helped “his Airness” carry bags to the locker room. Jordan needed seats for a couple of friends, but because of his own popularity, there were none to be found. As they chatted, Jordan offered up the deal to trade his shoes for Rodriguez’s two comped tickets that he got as part of the ball boy gig. The idea had never crossed Rodriguez’s mind. He was ready to give them away for free. After the game, he walked into the locker room to find Jordan swarmed by reporters at his locker when the NBA legend spied him among the horde. Jordan signed the size 13 Air Jordan VII Cardinal sneakers and handed them over. Rodriguez wrapped them in a towel and hid them in his locker from his boss and fellow ball boys until he could get out of the arena. Now, 24 years later, Rodriguez is putting the shoes up for auction. 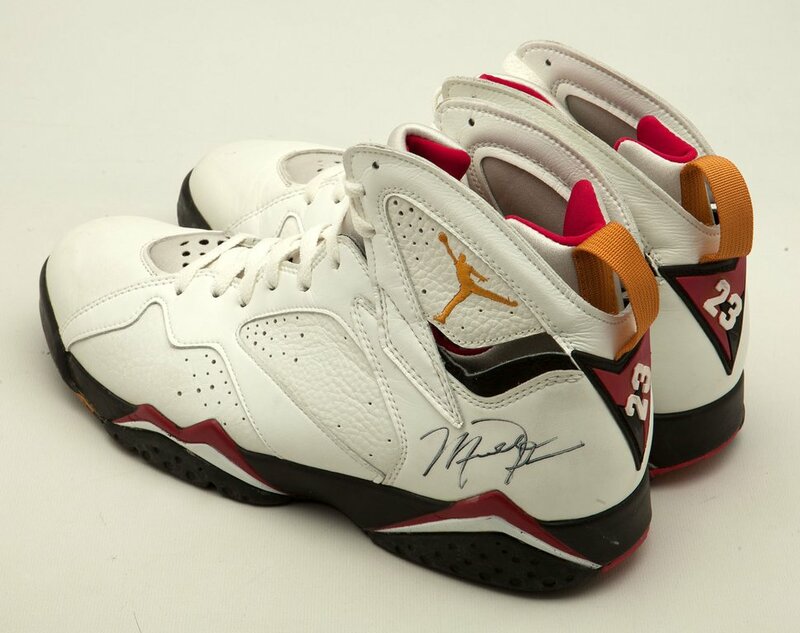 (Courtesy | SCP Auctions) Size 13 game-worn Air Jordan VII "Cardinal" style shoes that were given to former Utah Jazz ballboy Alex Rodriguez by Michael Jordan in 1993. John Hedberg brags that he was a ball boy longer than anyone with the Jazz organization, filling Gatorade coolers, folding towels and mopping up player sweat on the court from the age of 13 in the 1986-87 season until 11 years later in 1997-98. He and Rodriguez were friends at Brighton High School — bonding over a mutual love for athletic competition and Hedberg’s ping pong table. “It’s safe to say we were pretty popular in high school because everyone knew we had connections for tickets,” Hedberg said. Other friends had asked if he could hook them up with a job with the Jazz, but Rodriguez was his closest buddy, so Hedberg took him to a practice at Westminster College in the summer of 1990. Rodriguez helped Hedberg through the practice, handing towels to players and mopping up sweat on the court, and was quickly offered the job full time. 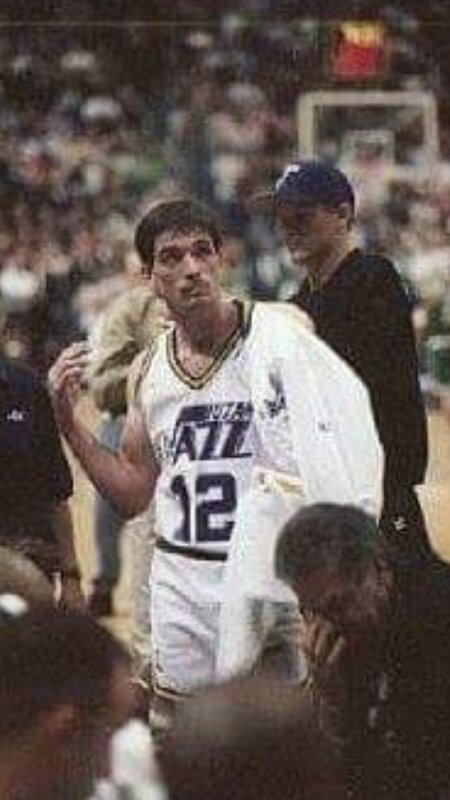 (Courtesy | Alex Rodriguez) Former Utah Jazz ballboy John Hedberg stands behind NBA Hall-of-Famer John Stockton. Then-Phoenix Suns forward Charles Barkley was on the taping table while Rodriguez was allowed to begin working in visiting locker rooms in his second year with the team. “Hey ball man, get me a red Gatorade,” Barkley called out to him. But Rodriguez ignored him, prompting a repeat request. Barkley and the rest of the Suns players began laughing. Hedberg said he was sometimes “embarrassed” to work with Rodriguez, who on occasion would heckle opposing teams‘ point guards that they’d get shown up by Stockton. Each ball boy worked for the visiting teams for about half of the 41 home games, and earned tips for running errands and making players feel comfortable. Hedberg got his fair share of memorabilia: multiple pairs of shoes from Patrick Ewing, Dennis Rodman, Barkley, Malone and Stockton — but never a pair of game-worn Jordan’s. A few weeks after Rodriguez got the shoes, Jordan returned to Utah for the 1993 All-Star Game. Jordan invited him and his older brother to his room at the Little America Hotel and brought them as guests to an All-Star party. Later in the evening, the brothers found themselves seated at a table with Jordan, George “Iceman” Gervin, Magic Johnson, Julius “Dr. J” Erving and Kareem Abdul-Jabbar. He worked with the Jazz until 1995 — leaving with $24,000 in saved tips and wages in his bank account — when balancing his studies at the University of Utah with the demands of working 41 home games every season became too much to handle. Both he and Hedberg now lament not having more photos of themselves from that time. Jumping from working one game to the next made it difficult to document their role in the Jazz franchise’s most successful era to date. Rodriguez, now a 44-year-old account manager for a dental technology company, believes it’s the right time to sell the shoes. “If it can help you better your life and help your kids’ lives be better, I decided it’s time to do something with them,” he said. The significance of the shoes has also been superseded by other responsibilities over time, says Hedberg, now 43 and living in St. George. “He doesn’t feel like they’re that important to him anymore as much as maybe they used to be,” he said. The shoes are up for auction on the SCP Auctions website through Saturday evening and were up to just over $7,000 as of Thursday afternoon. Rodriguez is hoping to get $50,000 for them, emphasizing that they were a part of a game where Jordan “was in the zone” and “could not be stopped” en route to an eventual third NBA title of six in his career. The shoes Jordan wore during the infamous “flu game” against the Jazz in the 1997 NBA Finals sold for more than $104,000 in 2014. In a ball boy career defined by memories of working around Hall-of-Famers, being “in the right place at the right moment on Earth” to assist Jordan with a pair of tickets tops them all. “I always knew that someday maybe this magical moment or karma or whatever you want to call it would help me in my life somewhere down the road,” Rodriguez said. For whoever owns the shoes next, he hopes a little bit of MJ’s magic rubs off on them too. “Maybe there’s something to the shoes that whoever buys them, it’ll help them in their life,” he said.